Long gone the time where city people could have plenty square feet / meters in their apartments or huge lands where their could place big houses with lots of rooms. Chances are those kinds of property are already transformed into commercial premises or rented out and listed on AirBnB (which in many cities creating an even more complicated house crisis). The scarcity of land in big cities now is a huge problem, and it gets complicated when it has become ‘the scarcity of space’, at literally micro level. It is even harder now to find a rentable living unit with decent size and decent price in big cities. Finding the ‘home’ in a city and owning it, no matter how small it is, sometimes in addition to the painful amount of monthly installments you have to pay for the sake of ownership, is very challenging. Especially for the millennials. 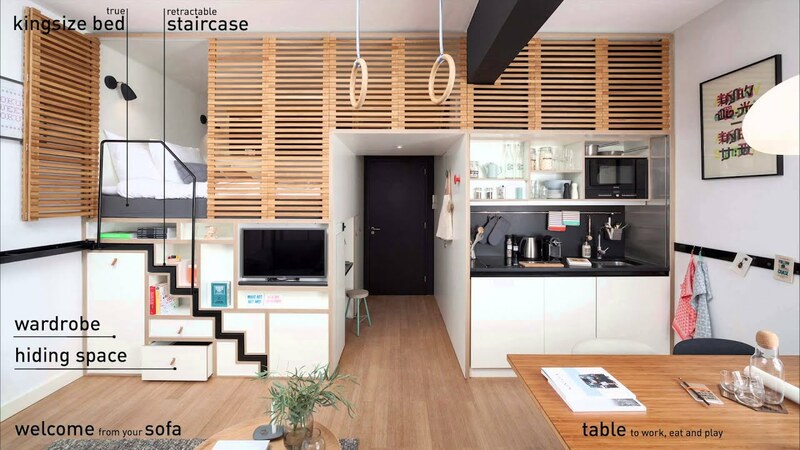 That’s why now micro apartment concept evolves amongst the new urban folks who try to find their comfort nests. The concept is not only a new trend in property market, it is a necessity, a force. The principle is to find a quite workable size of space that is within your budget located in a location that suits you enough. Even to make the size truly workable, we should arrange the space smartly, using one square foot / meter of space for multiple purposes or activities if possible, creating built-in and customized furniture that fits in to the room but able to accommodate your daily needs without sacrificing your comfort. Even Ikea, one of the most influencing and affordable furniture companies in the world (their products are now scattered in our many people’s homes, for sure) created their 2017 furniture design tailored to the modern market and provides some unique ideas for ways people can live smaller and smarter. Many media labelled Ikea to cast a bleak and depressing future houses, but is it really? Or living big in a small space is actually the acceptable and most reasonable life ethos for new modern people? Maybe it is time for us to create a simpler and less clutter-free life, being contemporary minimalists like the Japanese?